Tamraght is a charming village located on a hill overlooking the ocean, it is situated 14 km from Agadir and just 3 km from the famous Taghazout. Its welcoming inhabitants and growing surf culture make it the perfect place to spend an unforgettable holiday. Tamraght is facing eight surf spots and our Surf House is just a few minutes walk to Banana Beach, Spider and Devil´s Rock. It has some of the most consistent surfing conditions in the region, ranging from waves for those just starting out to large waves for experienced surfers. The region has a microclimate which includes an average of 330 days of sunshine per year. We offer many options for accommodation, for all tastes: double rooms with twin beds or with a double bed, modular rooms and the new concept of shared room in our special room “Waveland” a unique experience, just check the options and choose yours. There is also an amazing chill-out area where you can wind down, watching the sunset over the waves, drinking a cup of tea or taking part in a BBQ. The time takes on another dimension in our surf house and the hypnotic views takes you relax and completely disconnect. We offer many excursions (Paradise Valley, Imsouane, Agadir Souk,…) and extra activities (Camel route, massages, ….). You´ll never feel bored with us, the time will pass quickly because you´ll enjoy each second. 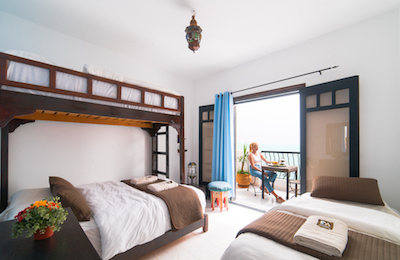 Our House is the tipical Moroccan one but with all the facilities that a surfer can dream with and the most important just closet to one of the most famous surf spots in the área: Banana Beach. 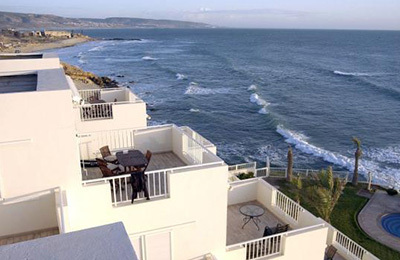 the nearest airport is Agadir (International Airport) just 20 minutes by car from the Surf House. Other option in Marrakech Airport (170 kms distance to Agadir). It means you come from other Moroccan city, the main companies are CTM and SUPRATOURS with really good and comfortable buses. The bus station is 15 minutes distance by car to our House. A one way ticket from Marrakech to Agadir bus sttaion is approx 10 EUR. If you prefer to take a roatrip , just ask for GPS coordinates follow the route. It is easy to find us, the first small village you will find when you leave Agadir in direction to Essaouira or Taghazaout. We provide Airport Transfers from and to Agadir, it is included in the packages and is extra for B&B clients. Also if you flight to Marrakesh we can provide you the transfer (extra fee). The prices depends on number of passengers and start from 10€. We provide also Bus Station Transfers from 5€ (depending number of persons). "Awesome place and awesome people! 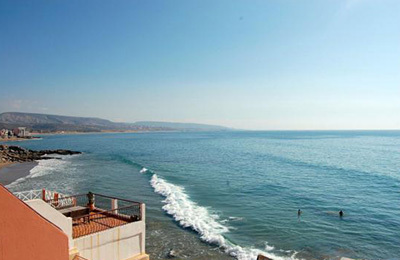 Right in front of the beach in one of the most consistents surf spots around. You can just wear the wetsuit in the hostel and go walking to the beach. True hostel atmosphere and easy to meet other people. All the staff is very friendly and surf motivated, they will help you with anything and even take you to a few lonely secret spots Thanks guys and see you soon!" "Hi really recommend to pay a visit to the Surf House! I had a wonderful time learning how to surf, getting to know locals and spending time with all of the fantastic people who work there and those who were on holiday as me. it really was an incredible experience :) "
"If you are travelling solo, this is the place. If you are travelling with friends, this is the place. If you are travelling with your couple, this is the place. If you want good, uncrowded surfing, this is the place. If you want a typical Moroccan experience, this is the place. If you want to chill out, this is the placce.... Surf house is simply, THE PLACE!! 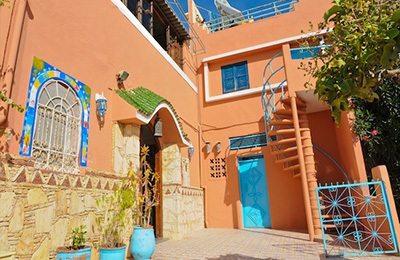 Located in a typical Moroccan village (only hostel/hotel in town). Sea view from most of the rooms and from its wonderful rooftop."